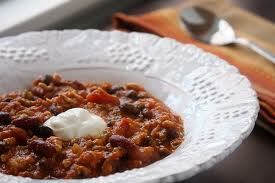 I experminted with something a little different this week when entering the First Annual Chili Cook-Off at the “Y”. I decide to try using something seasonal to make a unique chili instead of the traditional one I usually prepare. Too my surprise it was really pretty good, good enough to be the Grand Prize Winner! At first I was pretty skecptial trying something so unusual but decided what the heck, the worse that could happen was that no one would eat any. Boy, was I wrong. I didn’t even have a spoonful to bring home. Try it out for yourself, it’s really good. In a large pot over medium heat, cook beef until brown; drain. Stir in onion and bell pepper and cook 5 minutes. Stir in beans, tomato juice, diced tomatoes and pumpkin puree. Season with pumpkin pie spice, chili powder and sugar. Simmer 1 hour. Garnish with a dollop of sour cream and a sprinkle of dark chocolate.